Osmond: 'I stole my brother's date' Jump to media player Donny Osmond, the singer, actor, and most recently, a judge on Strictly Come Dancing has released his 60th album. Tess Daly loses shoe on Strictly Jump to media player TV presenter Tess Daly lost her shoe while making her entrance on BBC One's Strictly Come Dancing. How's Judy finding her Strictly experience? Jump to media player Judy Murray, tennis coach and Mum to Grand Slam champions Andy and Jamie, explains to BBC Get Inspired how she's finding her time on hit BBC One show Strictly Come Dancing. Donny Osmond, the singer, actor, and most recently, a judge on Strictly Come Dancing has released his 60th album. Soundtrack of My Life covers the highs and lows of half a century in show business. 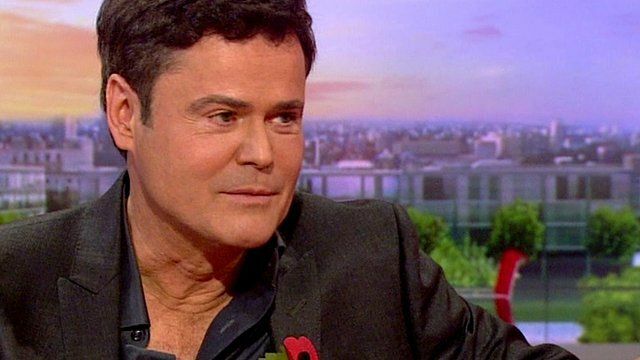 Mr Osmond told BBC Breakfast that one of the songs on the album reminded him of meeting his future wife, Debbie, who was dating his brother at the time.